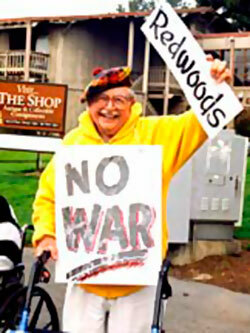 SENIORS FOR PEACE is an inspiring 26-minute documentary on a group of remarkably articulate and passionate senior peace activists (average age 85) from The Redwoods Retirement Community in Mill Valley, California. It will be broadcast on public television stations throughout the country beginning in April, 2004. 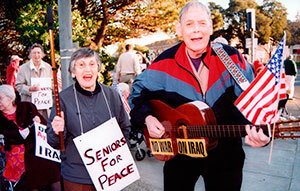 Produced and directed by David L. Brown, SENIORS FOR PEACE profiles the committed senior peace group that grew to a peak size of 160 members in the weeks before the war on Iraq. The group began expressing its strong opposition to the impending war six weeks before it began in spirited weekly demonstrations at the corner next to The Redwoods. 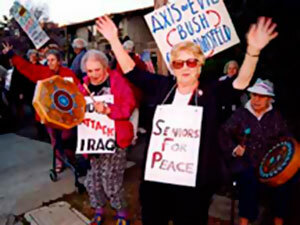 They celebrated their first anniversary on January 30, 2004, commemorated the first anniversary of the launch of the war on March 19, 2004, and continue their weekly demonstrations today. 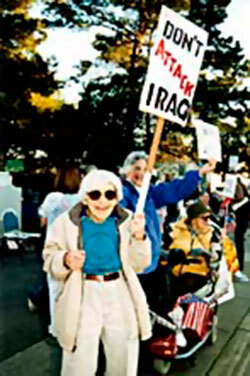 The documentary captures a number of the group’s energetic and colorful street demonstrations and features interviews with several participants expressing their passionate anti-war views. It also features some very moving personal stories of the members’ own war experiences in World War II and work in post-war disaster areas that have contributed to their present anti-war and social justice views. With compelling stories of surviving aerial bombing in London and Amsterdam, witnessing close friends killed and working with refugees in several countries, the members demonstrate an intimate personal knowledge of the horrors of war. They assert that these horrors have been unnecessarily inflicted on the people of Iraq as well as on American and British soldiers. The film illustrates the war stories with a variety of historical and contemporary Iraq war footage, much from middle-Eastern television stations. As the film documents, the SENIORS FOR PEACE have continued to hold weekly meetings to discuss current political issues and to arrive at lines of action to highlight and remedy acts of violence and other injustices. The members’ recent drive to repeal the Patriot Act resulted in a petition with 89 signatures that was sent to the White House, the Attorney General and other governmental officials. The film captures SENIORS FOR PEACE members at work making posters for the demonstrations (“When a Government Lies, Democracy Dies”), at a weekly meeting three months after principal combat ended and at the silent peace vigil in the courtyard of The Redwoods. The video raises many profound questions about the apparent lies and deception that were used to justify the Iraq war. It also presents an inspiring portrait of empowerment and the power of grassroots organizing. The filmmaker hopes that this documentary will serve as an effective vehicle to communicate the SENIORS FOR PEACE message to a very broad audience. The national PBS broadcast is being provided by the National Educational Telecommunications Association (NETA). 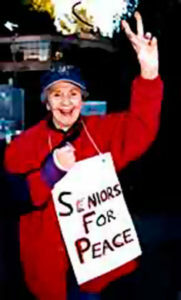 The SENIORS FOR PEACE video premiered to a sold-out audience and great acclaim at the Mill Valley Film Festival on October 12, 2003. It has screened in three other film festivals and generated numerous requests for screenings and cassettes by peace and justice and senior organizations. Nearly twenty organizations have since arranged for public screenings. The video will be submitted by the filmmaker to key peace and justice organizations and senior organizations throughout the country and to over fifty other film and video festivals. The video has been accepted for Bay Area PBS broadcasts on both KQED (airing April 4) and KTEH in the Video i series (airing May 3). On a national level, KTEH in cooperation with NETA (National Educational Telecommunications Association) will distribute the program to the entire PBS network with national PBS broadcasts following throughout the summer and fall of 2004. The producer is seeking to raise funding to promote and publicize these broadcasts in key cities, working in coordination with local peace and justice and senior organizations, especially in New York, Los Angeles, San Francisco, Chicago and Washington, D.C.When funding permits, publicists will be hired to enhance the publicity campaign in those key cities. Brown will also seek to find an educational distributor of peace and justice and/or senior media productions such as Terra Nova Films, the country’s largest distributor of aging-related documentaries. 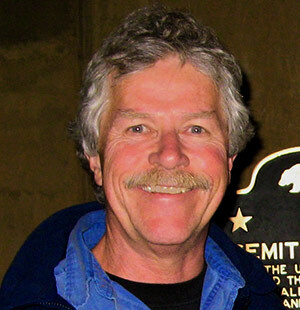 He will work closely with the SENIORS FOR PEACE and with many Bay Area peace and justice activists to organize, promote and publicize theatrical and non-theatrical screenings, first throughout the Bay Area and then, throughout the country. The filmmaker will also work closely with the national network of senior service providers, such as the American Society on Aging and AAHSA (American Association of Homes and Services for the Aged), to promote the video. Video cassettes and DVDs will be distributed and marketed both by the filmmaker and by the SENIORS FOR PEACE with proceeds going to further the distribution and promotion of the video. Funding will be sought from every foundation that supports media on peace and justice or senior issues and from numerous private donors who are supportive of the SENIORS FOR PEACE. Over thirty-five prospective foundations have been identified including MacArthur, Janelia, Babson, Bydale, HKH, Scherman Foundations and Peace Development Fund. Final completion of the broadcast version of the documentary was supported with $19,700 in private donorations and a $10,000 grant from the LEF Foundation. An additional $28,000 is being sought for distribution, outreach, promotion and publicizing the PBS broadcasts. A full distribution proposal with budget and attachments is available upon request. Fiscal sponsor: The video is fiscally sponsored by the Film Arts Foundation in San Francisco, a 501(c)(3) non-profit organization, that will receive and administer all funding. All donations to the project are tax-deductible if payable to Film Arts Foundation www.filmarts.org.